File Checksum Utility (FCU) is a free utility software. Setup program is available to install the software, but it could work without any installation and allows generating MD (Message Digest) and SHA (Secure Hash Algorithm) hashes from a single file. Checksum is an single value calculated from a content of file by special algorithm. You can also verify the file integrity of the downloaded document or program. File Checksum Utility is very easy to use. From the graphical user interface, choose the file or the directory from your computer storage. The tool calculate and display checksum values. You can copy the results to the clipboard or export it to a CSV, XML or TEXT file. The main supported algorithms include MD5 (Message Digest number 5), SHA-1 (Secure Hash Algorithm level 1), SHA-256 and SHA-512. 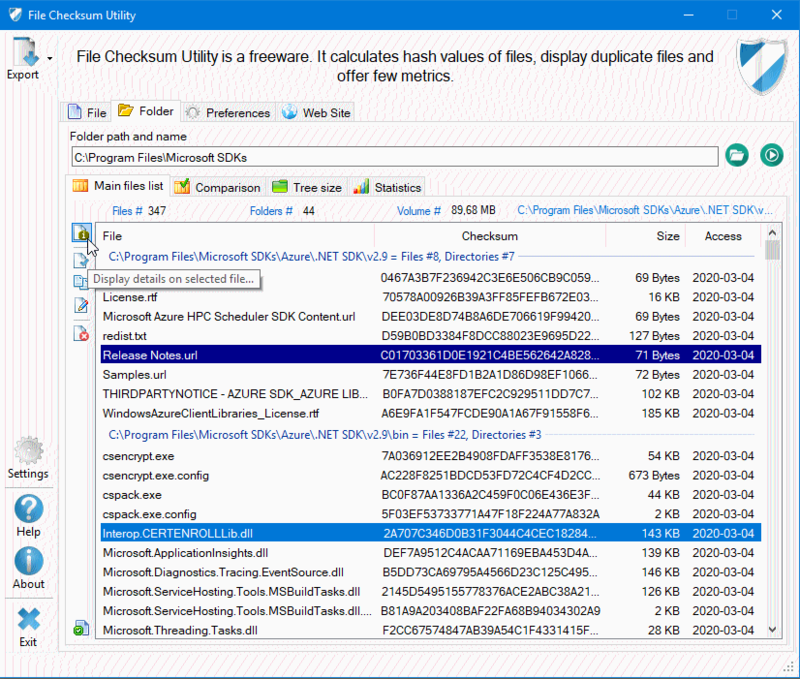 File Checksum Utility allows more with duplicated files detection, old files listing and statistics displaying. Your hard drives will be optimized by removing duplicate files or archiving the files not accessed. The software is really easy to sue. The end user chooses a directory and launches his exploration. All files are analyzed to keep only prefered extensions, calculate hash value, identity duplication, highlight oldest and bigger content and display statistics. Main software package does not require setup or other installation process. Use exe file directly - Portable/toGo Mode. File Checksum Utility supports Windows 10, 8.1, 8, 7 and XP. Including both 32-bit and 64-bit versions. Regarding Framework Microsoft .NET, there are 2 different Windows programs. First one works with Windows XP and higher and second one with Windows Seven and higher. Microsoft support is stopped with XP and the last .NET release is 4-0. The .NET 4-6 and 4-5 releases are only supported with Windows 7, 8 and higher. If you have any questions or suggestions about File Checksum Utility, please send an email (see about dialog from the software). Official support of last .NET 4-6-1 RC (Release Candidate). Display statistics of analyzed volume and identified file extension. Error messages are displayed in dedicated list during directories exploration. Graphical user interface improvement:volume information, configuration and chart graph. End user could choice the colors to identity bigger and oldest files. New labels for English and French languages. Official code signig of program and setup program. This sign is cupprted by all Windows platforms. Added information on selected file: type of file and small icon. New setup program with more information : Info button, direct access to Web site and reminder label to explain the software is free of charge (Freeware). Digital sign included: see file properties with mouse right click on program. It's not the right Code Signing also but certainly future release will include a real. New setup package with traditional Windows installation. Multi languages support with option list: English and French only but the software is ready to support more. Messages could be changed from an external Text file. New option to use a main directory in \My Documents\. It's important with classical Windows installation (Setup Mode). User can't use program directory to write preferences in. Add directories exploration to calculate hash code from filtered files. Add export result access of directory exploration. Record preferences in dedicated file.